C.B. Manville image of "Anvill (sic) Rock from above Deadwood". Anvil Rock has fallen down since this image was made, and is not a "known landmark" in the modern world. Modern view shows area at north end of Deadwood, highways leading to Sturgis and Spearfish in distance. 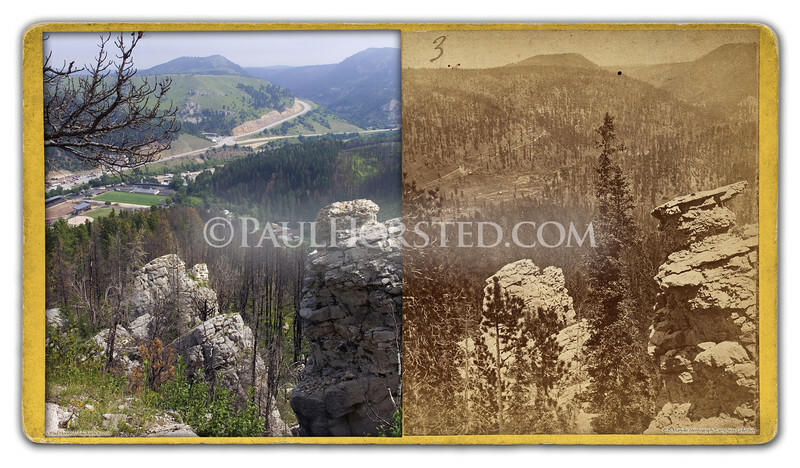 Taken from north end of "White Rocks" above Deadwood. Historic image courtesy Larry Ness. ©Paul Horsted, All Rights Reserved.